Finding the right person is important to a good relationship but at the same time, making it work doesn't necessarily come natural. Some people seem to really understand how to build and sustain a relationship whether a romantic one or a friendship. They find special ways of interacting, showing their affection, and keeping the bond going strong. I've had a problem with this but have met someone who is extremely good at it. As I spend more time with her, I feel I am depending on her to support the relationship. That's why I'm looking to better understand the different aspects of a successful relationship - does anyone have any good recommendations? I know there are countless relationship books but I'm looking for something that really gets to the heart of what is required for intimacy and sustaining an enjoyable, healthy relationship - ideally romantic. I've started to read "The Selfish Path to Romance: How to Love with Passion and Reason" by Edwin Locke and Ellen Kenner and it seems to be in line with what I'm looking for but gathering as much material as I can find - any other recommendations would be greatly appreciated. I think the 'secret' is to find out what the other person's needs and wants are. That is why they are in a relationship, to satisfy those needs. This is not easy, because we are all so different that what makes one person happy, can make another miserable. If you are compatible in this way, you have something to work with, Satisfy the other person, and you are on your way. The key to a great relationship is communication and the best book on that subject is by the founder of Cognitive Psychology, Aaron Beck. 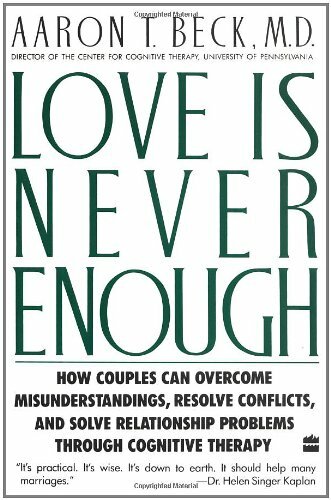 Love Is Never Enough: How Couples Can Overcome Misunderstandings, Resolve Conflicts, and Solve Relationship Problems Through Cognitive Therapy. On a slightly related note: I remember seeing an interview with a marriage counselor many years ago and he said something that really stuck with me. He said that, in his experience, couples who expressed contempt for each other were doomed to break apart. Examples could be saying, "Oh, you don't know what you're talking about...", "Whatever! ", etc. I've since remained forever guarded against ever talking to my spouse in a manner like that. Oh...there are times when I've been ticked, but I always work to stay focused and explain, in clear terms, what a problem might be and how we can solve it. I enjoy a good marriage to a beautiful woman. Thanks for everyone's advice. That book has been very interesting and I'm appreciate the recommendation! I'm far from an expert on relationships but I have always found it better to start from the other side of that coin. Find out what your wants and needs are, and communicate that to the other person. Then you can listen to the other persons wants and needs, and see if you match. Or put in a different way: Don't start by looking at others, start by making yourself visible first. I've found this to be very powerfull in all kinds of relationships. An interesting thing psychologically is that people will also want to reciprocate, because it gives them a chance to be valued. In the same way that you may take great pleasure in helping a friend, because it means you have something valuable to offer.